Meeting report of 24th Aug.
We have enjoyed so much today's Cosmos TMC meeting. Some guests came.We all welcome you next time,too. Watanabe-san for her very nice introduction of presenters using image of Icecream, Ownby-san for his "superb" workshop on tall tale and Sissonen-san for his new program of pronunciation practice. 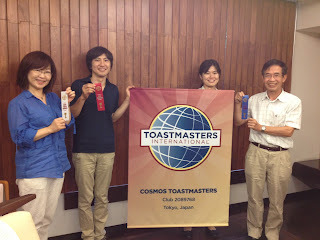 Next meeting will be Sep 21, in-house tall tale contest (both in English and Japanese) at Kantoku-tei in Koraken garden. All club members are eligible to enter except area officers. Let's challenge!